This stunning 8-minute tour begins with a fascinating look into the crater of an extinct volcano followed by a glorious flight over the remote and very beautiful peaks of Crown and Goat Mountains. 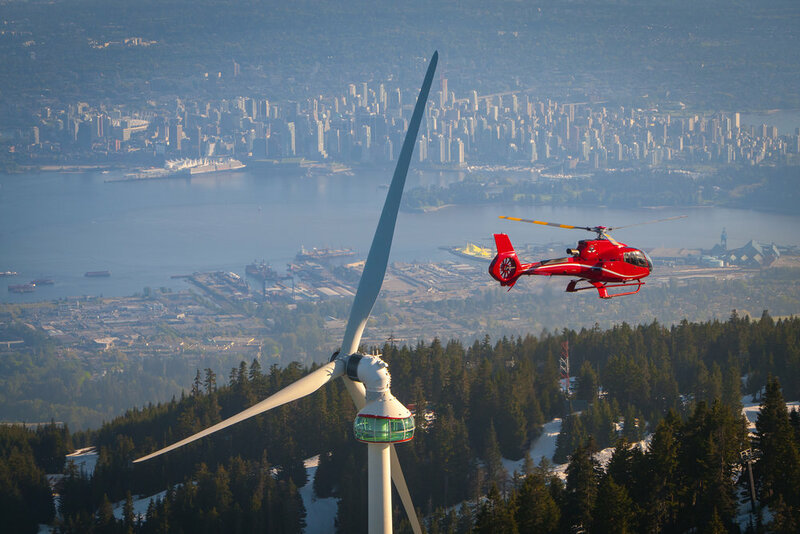 This scenery-packed 20-minute tour contains the most expansive views you’ll ever see of Vancouver’s breathtakingly beautiful coastline and mountains. Highlights include Grouse Mountain, the Lions Peak Mountains, Cypress Bowl, English Bay, Stanley Park, and downtown Vancouver. This inspirational 15-minute tour combines all of the highlights of the Crown Mountain Tour with a lovely scenic journey over the Capilano Valley followed by a climb to the legendary Lions for a flight between the peaks. Tours operate from 11:00am – Dusk. All tours are weather dependent. All tours operate on top of Grouse Mountain, across from the Peak Chalet. * * Combined guest weight cannot exceed 600lbs/272kg per flight. Please note that weight restrictions vary based on weather and temperature. Flights may have to be rescheduled or split into separate flights. Additional charges will apply.